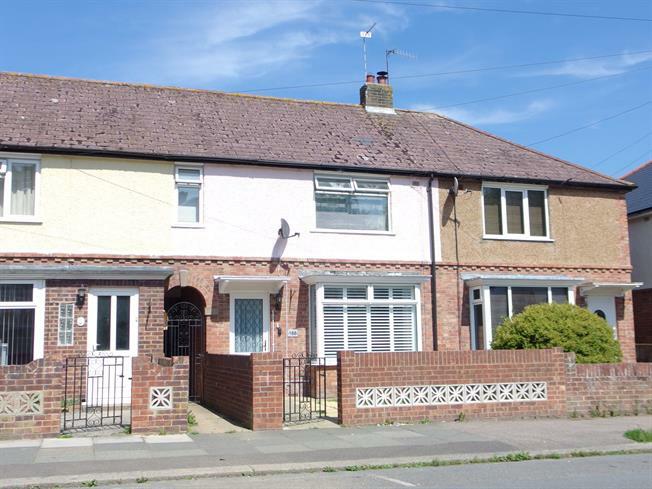 2 Bedroom Terraced House For Sale in Dover for Offers in excess of £240,000. Providing that extra accommodation both downstairs and up, this very well presented two double bedroom home is in a great location. The bay fronted living room leads to the good sized, recently-fitted kitchen, with a dining room/garden room to the rear, depending upon your preferences. There is also a handy downstairs cloakroom. Upstairs the large main bedroom has the advantage of a dressing room whilst the second bedroom and bathroom are also well proportioned. Outside, the landscaped rear lawned garden has an impressive summerhouse to the raised patio. Double glazed, uPVC front door. Radiator, carpeted flooring. Double glazed uPVC box bay window facing the front. Radiator, carpeted flooring, chimney breast, under stair storage. Wooden double glazed doors opening onto the patio. Double aspect double glazed wood windows facing the rear overlooking the garden. Radiator, carpeted flooring. Radiator, vinyl flooring. Granite effect work surface, fitted wall and base units, one and a half bowl sink, space for range oven, overhead extractor, integrated dishwasher, space for washing machine, space for dryer, fridge/freezer in built-in storage cupboard. Double glazed uPVC window with obscure glass. Vinyl flooring. Standard WC, wash hand basin. Double glazed uPVC window with obscure glass. Radiator, laminate flooring. Standard WC, panelled bath, shower over bath, pedestal sink.